The Mergui Archipelago is still absolutely pristine and untouched by tourism, with dozens of islands and anchorages to choose from, one is unlikely to meet anyone except for the occasional sea gypsy. While in Burma we must have a guide on board. This is not a problem as they are often young students and can be helpful on board. We have found that it is best to start the trip from Kawthoung on the Burmese border as the trip north from Phuket is usually into the wind and can take up time better spent in Burma. 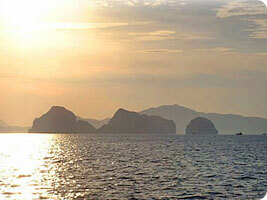 However we do offer a a 4 day option to sail down wind back to Phuket through the offshore islands. Visit the Burma itinerary page to know more about the cruise.